Home Uncategorized MAT September 2013 Online Registration, Eligibility Criteria & Information. MAT September 2013 Online Registration, Eligibility Criteria & Information. Application process for MAT examination on September 2013 has been started already. Candidates can apply for MAT September 2013 through Online Registration or through collect the Application Form . .And examination will also done by two modes one is paper based and other is computer based. Pen-Paper based examination will held on 1st September, 2013. And computer based examination will start from 7th September, 2013. For admission on MBA course this entrance exam will held. In India there are 600 institute, which are recognised for MBA course. MAT is an Eligibility Test for admission on MBA course on various institutions in India. Students who passed the Graduation Degree on any stream can apply for this examination. Last year students can also apply for this exam with several conditions. .On West Bengal there are two exam centers, one is Kolkata and other is Durgapur. Durgapur center candidates can apply only for pen paper based exam. And on Kolkata center candidates can apply fro both pen-paper & computer based exam. For apply for MAT September 201y examination candidates can collect the Application Form with Information Brochure or CD. For collect the Application Form you must pay Rs. 1200/- on Bank of Boroda or Axis Bank. Application Form are available on some selected branches of Bank of Boroda & Axis Bank. Candidates can collect the Application Form with Information Brochure or CD from enlisted study center of AIMA. Candidates can checked the selected Bank branch and study center on AIMA’s official website, www.aima.in. Students can also apply online for MAT September 2013. For apply, candidates at first make a draft for ‘All India Management Association‘. The amount of draft is Rs. 1200/-. The visit the online application website, http://apps.aima.in/matsept2013. For fill-up the application form online, the draft information is required. Candidates can pay the examination fees through Credit Card or Debit Card for online application. After fill-up the application form online, must take a print out of the Registration form or the Application form (for offline candidates). And submit it to AIMA’s New Delhi office. Last date of submit the application form is 19th August, 2013 . 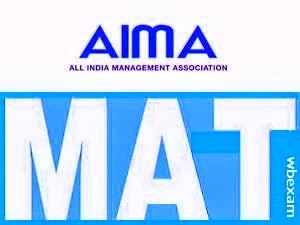 Students can get more information about MAT September 2013 examination on the following website, www.aima.in. You can call on this following phone numbers: (011) 2464-5199 / 2461-7354. • Paper Based Exam : 1st September. • Computer Based Exam : 7th September. • Last date of sale Application Form : 14th August. • Last Date of submission Application Form : 17th August. • Last date of Online Registration : 14th August. • Last date of submission Registration Form : 17th August. If you have any query, questions about this MAT examination than must post your query, questions and suggestions on comment box. We try to help you at our best. And always care your suggestion to improve this site. And we always to to post useful article for Indian students. So please keep visiting and share your knowledge on this blogsite.